"[Arms Control Today] has become indispensable! I think it is the combination of the critical period we are in and the quality of the product. I found myself reading the May issue from cover to cover." Satellite imagery suggests that Saudi Arabia has built its first facility to produce ballistic missiles, according to U.S. open-source analyses completed in late January. Such a factory would augment Riyadh’s existing arsenal of Chinese-supplied, intermediate-range ballistic missiles. Images of the al-Watah missile base analyzed by the Middlebury Institute of International Studies at Monterey indicate that Saudi Arabia has expanded the facility to include a rocket-engine production and test facility, although it is unclear if the facilities are actually producing missiles at this point. The plant’s characteristics indicate that the Middle Eastern power is pursuing ballistic missiles with solid-fueled rocket engines, which can be launched more quickly than liquid-fueled systems. Analysts asked by The Washington Post to study the images concurred with the Middlebury team. The existence of a Saudi ballistic missile production facility and the uncertain future of the Iran nuclear deal raises concerns that Riyadh may be pursuing capabilities needed for a covert nuclear weapons program. Saudi Arabia is currently negotiating a civil nuclear cooperation agreement with the United States and has been reluctant to forgo uranium enrichment and plutonium reprocessing for fuel production or agree to more stringent international oversight as part of the deal. Saudi Crown Prince Mohammed bin Salman said in March 2018 that “if Iran developed a nuclear bomb, we will follow suit as soon as possible." The U.S. Defense Department annual report on China’s military power says that Beijing is developing new nuclear weapons delivery systems and is moving to deploy a new missile defense interceptor. The report, released Aug. 16, said China is developing two air-launched ballistic missiles, one of which may be nuclear weapons capable. That missile has been flight-tested five times, according to an April report in The Diplomat. This development is significant because air-launched ballistic missiles cannot be intercepted in the boost- or midcourse phase. China displayed the DF-31AG intercontinental ballistic missile (ICBM), an enhanced version of the DF-31A, for the first time in 2017 at the People’s Liberation Army’s 90th anniversary parade, the Defense Department report notes. China “appears to be considering” additional launch options for the DF-41 ICBM, which is still under development after being tested 10 times, including rail-mobile and silo-based launch options, the report notes. The report also cited Chinese development work on a new nuclear-capable bomber, with an estimated range of at least 8,500 kilometers (5,300 miles), that could debut within a decade. Let me thank the organizers of today’s conference for bringing me again to Japan. In my current focus outside the government of the United States, continuing to push for real progress on nonproliferation and arms control measures, it's always a special pleasure to come to Japan. The Japanese role in leading the international diplomatic challenge to create the highest standards in arms control and nonproliferation is unparalleled. Not only as a partner of the United States but in its own leadership role, Japan has done much to create the modern nonproliferation regime that has greatly reduced but not yet eliminated the threat that weapons of mass destruction pose to all of us. It is especially moving to be here in Nagasaki. Visiting the memorial yesterday, a sacred place, brought back to me what President Abraham Lincoln said at the site of the bloodiest battle America ever witnessed: that those who have fallen on this site “have consecrated it far above our poor power to add or detract”. I sensed on this spot what no book can convey: the enormous challenge and the risk that humanity continues to face in the presence of 15,000 nuclear weapons in this world. Here I want to commend the very special role the hibakusha have played in preserving vital lessons for the memory of humanity. For 70 years, they have spread the simple truth that a human being is not just a statistic. They will touch future generations long after their own has passed from this world. I wish that every American and every world leader would have the opportunity to visit Hiroshima and Nagasaki as I have. It is much easier to talk about the challenges to nuclear disarmament than it is to describe a simple path to a world free of nuclear weapons. So let me dwell first on the current challenges that we face. First, the two major nuclear powers, the United States and the Russian Federation, have passed a turning point in their nuclear doctrines and nuclear arsenals. After about 40 years of a steady decrease in the size and diversity of their nuclear arsenals and the mission that each assigned to their nuclear weapons, both Washington and Moscow have turned a corner towards expanding the size and variety of arsenals and the circumstances for their use. The U.S. administration’s Nuclear Posture Review from this February is not a radical change from the previous nuclear posture but it is a significant change in direction. In calling for the development of new low-yield nuclear weapons, the United States is thinking more actively and – in my view - making more thinkable the use of low-yield nuclear weapons in the context of a conventional conflict. As so many have pointed out, there is no such thing as a limited nuclear war once that threshold has been crossed. “A nuclear weapon is a nuclear weapon," George Shultz, who served as President Ronald Reagan's top diplomat, told the Senate Armed Services Committee in January. "You use a small one, then you go to a bigger one. I think nuclear weapons are nuclear weapons and we need to draw the line there." Secondly, the Nuclear Posture Review describes with more specificity than before circumstances under which the United States would consider the use of nuclear weapons to encompass not only first use by an opponent but also a response to a devastating attack by cyber or other means. Just two years ago, the Obama administration considered carefully the possibility of proclaiming a no-first-use doctrine for U.S. nuclear weapons. That U.S. policy has now shifted towards a broader definition of possible first use is of deep concern to me. Finally, I am most disappointed in the Nuclear Posture Review in that it effectively renounces the traditional leadership that the U.S has exercised on non-proliferation and arms control issues. It makes no mention of America’s binding legal obligation under Article VI of the Nuclear Nonproliferation Treaty to pursue a reduction in arsenals. It makes no new proposals for how the U.S. will move forward in negotiations with Russia and others. And it defers any meaningful action until security conditions in the world have improved. This retreat from global leadership, whether in arms control, in climate policy or in free trade agreements is unworthy of a nation that claims to be a superpower. As concerned as I am about the direction of U.S. policy, I am even more concerned about the continuing development by Russia of new weapons and new delivery methods. Russia seems driven by an exaggerated fear, in fact, a paranoia, about the future capabilities of U.S. missile defense. I call these fears exaggerated because I believe that missile defense can never provide an impenetrable shield. Russia is building not only new generations of ICBMs but even more dangerous weapons systems that seem to step out of the pages of a science fiction comic book, including a nuclear torpedo of unlimited range and a nuclear-powered cruise missile. Russia seems intent on probing the boundaries of existing arms control agreements, particularly the Intermediate-Range Nuclear Forces Treaty which laid the basis for the next 25 years of successful arms limitations. Even more than the uninformed statements by the U.S. president, the rhetoric of the Russian president - increasingly defining Russia’s national power as a function of its nuclear arsenal - erodes both the prospect of future arms control and the moral taboo against initiating the use of nuclear weapons. The 2010 New Strategic Arms Reduction Treaty is due to expire in 2021 and although President Putin has raised the prospect of extending the treaty, President Trump has so far rebuffed such proposals. In the shorter term, I am especially concerned about the U.S. decision to withdraw from, that is to violate, the Joint Comprehensive Program of Action with Iran. This agreement is unprecedented, both in its inspection and verification requirements, and it prevented the risk of a tenth state breaking into the nuclear weapons club. I do not believe that Iranian development of a nuclear weapon is imminent but I am deeply concerned about the follow-on effects of this decision, that is the undermining of U.S. credibility and commitment to any agreement, the creation of a serious dispute between the U.S. and its best allies in Europe and Asia, the erosion of the international rules-based order and a resurgent radicalism in Iran. I am less pessimistic but still deeply concerned about North Korea’s nuclear weapons program. President Trump did the right thing, trading in violent rhetoric for an opportunity for dialogue. There are dozens of reasons to distrust North Korea’s approach to negotiations and to doubt the capability of the Trump administration to negotiate a meaningful, verifiable denuclearization of North Korea. But the pursuit of negotiation is far preferable to simply sleepwalking towards war, as we seemed to be doing a year ago. The nuclear Nonproliferation Treaty remains central to our shared global ambition to prevent the development of new nuclear weapons and to reduce existing arsenals. On the surface, the deliberations at NPT conferences often seem utterly divorced from the real world. In fact, all the concerns I’ve just listed have a real effect on the degree of consensus you can reach among NPT parties and on the commitment that other parties show to the treaty. For the 2020 Review Conference, I can foresee the worst but I am determined to work for the best. The RevCon can easily be upset either by the U.S. and Russia sniping at each other or by the continued inability of the states in the Middle East to sit down together and begin the process of discussing a nuclear-weapon-free-zone in the Middle East. But the most severe threat to the unity of states-parties is the growing frustration of non-nuclear weapon states with the pace of nuclear disarmament. Seeing no new U.S.-Russian agreements since 2010 and the new threatening developments in Washington and Moscow that I’ve already described, the majority of the world’s non-nuclear weapon states have made clear that they will demand more urgent progress in 2020. So what can we do to move towards a world free from nuclear weapons? There are a number of steps that the United States and Russia could take right now that would change the current trajectory. First and most simply, to hear President Trump and President Putin repeat what Mikhail Gorbachev and Ronald Reagan said in 1985 - that a nuclear war can never be won and must never be fought - would be of value, would provide some reassurance that these two leaders understand their responsibilities to humanity. Secondly, the United States and Russia need to extend New START. Third, they need to make a political decision to work harder on resolving the dispute about compliance with the Intermediate Nuclear Forces treaty. And fourth there needs to be a more regular dialogue between Moscow and Washington on both the military and political level, to pursue risk reduction measures that would prevent a conventional conflict from escalating to a nuclear one and to explore other steps that would allow each to maintain security at a lower level of armament. Finally, the United States should reassert the leadership it showed after 2010 when it led an intensive dialogue among the P5 nuclear-weapon states to give the world greater transparency, to reduce nuclear risks, and to lay the groundwork for future multilateral arms control. It’s not easy to get either Donald Trump or Vladimir Putin to do something that reminds them of Mikhail Gorbachev or Barack Obama. In fact, it’s not easy to get them to do something unless you can convince them that it was their own brilliant idea. But it is an obligation of the rest of the world to continue to press for this. I know from my own experience with bilateral diplomacy that meetings with either Russian or American leaders always have an agenda filled with urgent items and that concerns about long-term items such as arms control simply fall out of the conversation. It is crucial that not only Japanese leaders but all world leaders press both Presidents to take serious action. Beyond Moscow and Washington, what can non-nuclear weapon states do for themselves to move us towards a nuclear-weapon-free world? Many non-nuclear weapon states have sought to answer that question by negotiating a new treaty banning nuclear weapons, adopted last July. The drafting of the Treaty on the Prohibition of Nuclear Weapons last year was historic. Some would like to see it as simply an expression of frustration on the part of the non-nuclear weapon states. It’s a lot more than that. It is a strong moral and ethical statement. And more than that, it is something tangible, something that can be touched by the hibakusha and the citizens of Nagasaki and Hiroshima. It is a statement of reality that the risk of nuclear war is not born only by the nuclear-weapon states but by the entire world. And it is intended to serve as an impulse for further action globally on nuclear disarmament. I’m well aware of its limitations. The TPNW will not by itself immediately eliminate any nuclear weapons. And it does not provide a pathway for Washington and Moscow to overcome their current impasse. I don’t see the discussion between advocates and skeptics of the TPNW as being an argument about practicalities or about whether this treaty can work. It is - or it should be - a respectful discussion about deterrence. Nations that face no immediate military threat tend to underestimate the importance that military alliances and military deterrence play for those states that do face actual military threats. Similarly, those states whether in Europe or in Asia that feel reassurance under the nuclear umbrella of the United States tend not to appreciate how strongly concerned other states are about the disastrous humanitarian effects that a nuclear war would cause. What is needed now is a multi-sided discussion on a topic that is easy to define and extremely difficult to resolve: how to guarantee the security of the world and of each nation without resort to nuclear deterrence. This is a discussion that has to bring together not only the idealists and social activists who helped to bring about the TPNW but also the security experts and military leaders who have the responsibility of providing for their nations’ security. It has to bring together not only nuclear-weapon states but those who are allies of nuclear-weapon states and those who feel themselves to be far from any military threat. Given my own experience with the ineffectiveness of the United Nations as a place to discuss such difficult issues, I think it has to start smaller than a conference of 190 countries. Washington and Moscow are not going to lead this discussion. What can the rest of the world do? The UN Secretary General has laid out a comprehensive blueprint on what needs to be done on disarmament issues to provide genuine security for our citizens. I love the document. I’d like to focus in particular on what he says about nuclear disarmament. He calls on the United States and Russia to resolve INF compliance concerns, extend New START and pursue additional reductions. He encourages all states to sign and ratify the Comprehensive Test Ban Treaty, to negotiate a fissile material cutoff treaty, establish a zone free of nuclear weapons in the Middle East, pursue nuclear risk reduction measures, and develop nuclear disarmament verification standards and techniques. He warned that the international community is moving backward on disarmament. “Let us all work together to bring new urgency to achieve the universal goal of a nuclear-weapon-free world,” he said while unveiling his agenda at the University of Geneva in late May. So how do we take forward an idea on which not only everyone in this room but most of the world is united upon? Now is the time to convene a high-level summit approach to help overcome the impasse on nuclear disarmament. Leaders from a core group of states can invite their counterparts - 20 to 30 heads of states of nuclear weapon and non-nuclear weapon countries - to join a one or two day summit on steps to achieve a world free of nuclear weapons. This could be a starting point for ongoing regular disarmament discussions at the expert and ministerial level. As the former foreign minister Kishida argued, this dialogue must be based both on a clear understanding of the devastating impact of nuclear weapon use and an objective assessment of the security concerns of states. This is not a new idea. Four of the best American thinkers on such issues - George Shultz, William Perry, Henry Kissinger, Sam Nunn - have been arguing for several years for a Joint Enterprise, a new multilateral effort that would take concrete, practical steps to create the conditions that would make possible genuine nuclear disarmament. As outlined by the “four horsemen,” a Joint Enterprise summit would be supplemented by a joint communique from all participating states and national commitments to work towards disarmament. Unfortunately, the leadership of such an effort will not come from either Washington or Moscow. When the long-time ‘leader of the free world’ is deliberately stepping away from leadership, the other democratic nations of the world must take up the challenge. It’s up to Japan, to Germany, to Canada, to other nations that still believe in multilateralism to get this effort started. Discussion of the conditions that would help achieve a nuclear weapons-free world must become as common among world leaders as discussions about tariffs or immigration. The constant raising of this topic is the responsibility of Presidents and Prime Ministers, and it is the duty of citizens of all nations to remind their leaders of this responsibility. Qatar riled its Persian Gulf neighbors when it displayed a previously unseen, Chinese-made short-range ballistic missile system at a military parade. The sale of the missiles had not been public knowledge until they were spotted on transporter-erector launchers in a Dec. 17 rehearsal for the Qatar National Day Parade. Joseph Dempsey, a research associate at the International Institute for Strategic Studies, recognized the missiles, which he highlighted in a series of Twitter posts. In an observation confirmed by other analysts, he noted that the two eight-axle launcher vehicles in the parade appeared to be configured to carry BP-12A ballistic missile canisters, although they could alternatively carry eight canisters for the smaller, related SY-400 missile. Officials from the China National Precision Machinery Import/Export Corp. marketed the BP-12A at an international arms show in 2012 as having a range up to 280 kilometers (173 miles) and a payload capability of 480 kilograms. The SY-400 is believed to have a similar or slightly shorter range and roughly half the payload capability. The sale of the BP-12A does not appear to violate the Missile Technology Control Regime (MTCR), which urges its 35 members to restrict exports of missile technologies capable of carrying a 500-kilogram payload a distance of at least 300 kilometers. China’s bid to join the MTCR was rejected in 2004 due to concern that Chinese entities were continuing to provide missile technology to North Korea, although at the time Beijing voluntarily pledged to follow the regime’s export control guidelines and has since generally tightened its export controls. In recent years, China has increasingly marketed and sold the SY-400 and other missile systems to foreign customers, particularly in the Middle East. The following chart lists 31 countries, including the United States and its allies, which currently possess ballistic missiles. For each country, the chart details the type of missile, its operational status, and the best-known public estimates of each missile’s range. Only nine (China, France, India, Israel, North Korea, Pakistan, Russia, the United Kingdom, and the United States) of the 31 states below are known or suspected of possessing nuclear weapons. These nine states and Iran have produced or flight-tested missiles with ranges exceeding 1,000 kilometers. China and Russia are the only two states that are not U.S. allies that have a proven capability to launch ballistic missiles from their territories that can strike the continental United States. This factsheet does not list countries' cruise missiles. Intercontinental ballistic missiles (ICBMs), traveling more than 5,500 kilometers. Short- and medium-range ballistic missiles are referred to as theater ballistic missiles, whereas ICBMs or long-range ballistic missiles are described as strategic ballistic missiles. Missiles are often classified by fuel-type: liquid or solid propellants. Missiles with solid fuel require less maintenance and preparation time than missiles with liquid fuel because solid-propellants have the fuel and oxidizer together, whereas liquid-fueled missiles must keep the two separated until right before deployment. 1. All missiles are surface-to-surface unless otherwise noted. SLBM is an acronym for a submarine-launched ballistic missile and ASBM is an acronym for an anti-ship ballistic missile. 2. The ranges, given in kilometers (km) are estimates based on publicly available sources. These figures, however, do not all necessarily reflect the missile’s maximum range, which may vary with its payload. Equipping a missile with a lighter payload would increase its range. Similarly, a heavier payload would diminish a missile’s range. 3. A January 15, 2001 report by the UN Monitoring Group on Afghanistan concluded that, prior to the October 2001 U.S.-led offensive in Afghanistan, there were approximately 100 Scud-B missiles and at least four Scud mobile launchers in Afghanistan. The current distribution and operational capability of the missiles are unknown, although the UN Monitoring Group speculated that up to 30 of the missiles might be under control of the Northern Alliance. 4. According to a 1997 report by Lev Rokhlin, then-Chairman of the Russian State Duma’s Committee on Defense, Russia transferred eight Scud-B ballistic missiles and 24 Scud launchers, along with other military hardware, to Armenia between 1993-1996. Responding to publication of the report in the Russian newspaper Nezavisimaya Gazeta and to formal requests by the Azerbaijan government, then-Russian President Boris Yeltsin ordered an investigation into the claims. They were subsequently confirmed in April 1997 by Aman Tuleyev, then-Russian minister for relations with the Commonwealth of Independent States. 5. According to the Department of Defense’s 2009 report on China’s military power, Beijing is investing in conventionally-armed ASBMs based on the CSS-5 airframe which could employ “terminal-sensitive penetrating sub-munitions” in order to hold surface ships at risk. 6. 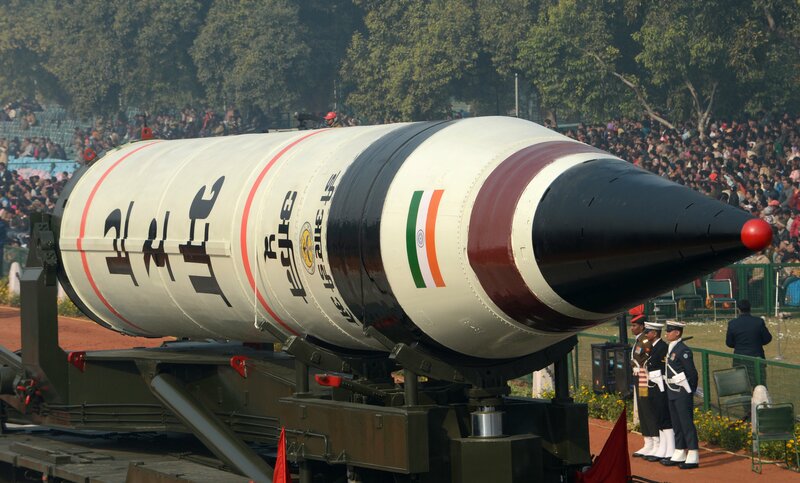 India and Pakistan claim that their missiles are not deployed, meaning that the missiles are not on launchers, aimed at particular locations, or kept on a high state of alert. The missiles are in a state of “induction” with the nuclear warheads stored in facilities separate from the missile units and airfields. Pakistan and India, however, have deployed their missiles on a number of occasions, such as the Kargil crisis in July 1999. 8. According to a CIA Report, Libya privately pledged to the United States in 2003 that it would eliminate all missiles classified as Category I systems by the MTCR. Category I pertains to missiles capable of traveling 300 kilometers or more with a payload of at least 500 kilograms, the presumed minimum weight for a first-generation nuclear warhead. Libya, however, still maintains a missile development program for systems that fall below the Category I threshold capability. Given Libya's obligations under its 2003 WMD renunciation, development of its Al-Fatah missile is on hold until it can meet MTCR requirements. Additionally, Libya's Scud-B arsenal is of questionable utility due to poor maintenance and testing record. 9. The Taepo Dong-1 was first flight-tested August 31, 1998. Its first two stages worked but a third stage failed. The missile has not been flight-tested again and is widely believed to have been a technology demonstrator rather than a missile system intended for deployment. 10. North Korea has carried out two flight tests of what is believed to be its Taepo Dong-2 missile. The test of a two-stage version failed about 40 seconds into its flight on July 5, 2006. The missile is assessed to have used a cluster of No Dong missiles for its first stage and a Scud or No Dong-based second stage. On April 5, 2009, North Korea launched what it called its Unha-2 space launch vehicle, widely believed to be a three-stage variant of its Taepo Dong-2. The first two stages of the rocket were successful and fell in the splashdown zones previously announced by North Korea. U.S. Northern Command said the day of the launch that the third stage and its payload both landed in the Pacific Ocean. Independent analysts assess that the second stage of the Taepo Dong-2 is based on a variant of the Soviet SS-N-6. 11. Although North Korea has never flight-tested the intermediate-range Musudan, a variant of the SS-N-6, Washington alleges that Pyongyang has deployed the missile. The SS-N-6 originally was a Soviet submarine-launched ballistic missile, but North Korea is reportedly deploying it as a road-mobile missile. There also is speculation that North Korea has transferred this missile to Iran. 12. Development of the Ghauri-3 missile was reportedly abandonded for unknown reasons. 13. The SS-27 (Topol-M/RS-12M) is deployed in both road-mobile and silo-based configurations.